1 of 1 Place 1 standard-size nori sheet on a piece of plastic wrap. Spread 3/4 cup cooked rice to within 1 inch of edges of nori. Place 2 oz smoked salmon slightly to center right, followed by 1 oz cold cream cheese (cut into planks from an 8 oz block), 1/2 sliced avocado and 1/4 cup English cucumber, cut into matchsticks. Roll tightly, using plastic wrap. Slice in half on the bias. 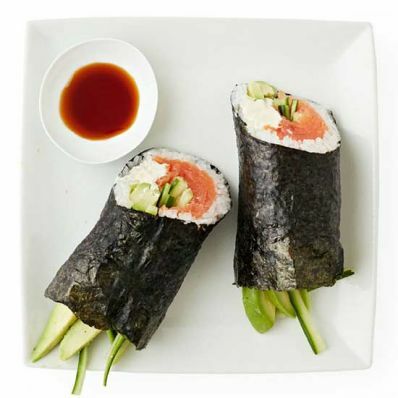 Repeat with a second nori wrapper and same ingredients. Serve with soy sauce.